Because today’s not just about celebrating Halloween, but about celebrating us. My costume takes a little explanation. We’re having a sales contest here based on the game Clue. The HR manager, Janice, agreed to be the “victim” in the contest newsletters. This included a shot of her body at the morgue with the feet and toe tag exposed. Of course, they used clip art of a man’s feet. She spent the next few weeks joking about how they weren’t hers, her were nice and dainty etc. Note that the woman in the black suit dressed as Sarah Palin is actually Janice, whose body we were portraying. And we won Best Group costume! Here’s photos of us, including details I made for them such as creating a Discontinued Product screen under her name; hospital ID tags (with the name of high class shoe fashion designers as the doctors’ names); and my sinus x-rays. Andy even had his wife paint his toenails! Tonight, Becky and Sophia are coming over. I’m going Trick and Treating with them in our neighborhood; I promised Sophia that the dogs would go with her (hence my avatar). She asked if they would be in costume. Well, John had bought glow-in-the-dark bracelets/necklaces for the Christmas Lights tour this December, and Becky had bought the dogs lighted tags a few years ago. 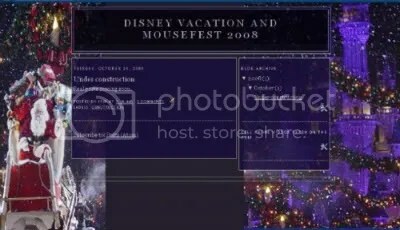 So I said I’d put necklaces around the dogs’ necks and their light up tags; I joked that they were going as Disney’s Electric Light Parade and then, since she didn’t get that, I said they were Spectromagic (the newer parade of lights; Becky actually performed in Spectromagic years ago). I don’t know who will have more fun tonight: Sophia, me…. or the dogs, in the middle of all the people and excitement. This is perfect! I used to have a cellphone holder that was open on the top. TWICE this happened to me! So it not only makes me laugh, but it makes me feel good to know that so many other people had this happen to them (my sister Gerry flushed hers once), that they made a t-shirt for it. 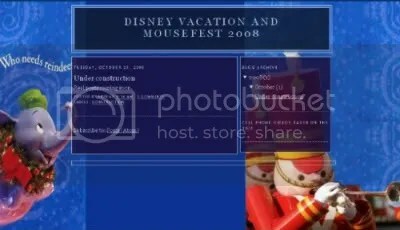 Which Disney-Mousefest vacation blog design do you prefer? If you read my blog last year, you know I made a separate vacation blog for our December trip. I blogged with text, photos, and videos from my phone, and then more each day from Fort Wilderness. I started playing around with a design for this year’s trip (ha ha, Steve Allen! Now it’s my turn! ), and I can’t decide. So I thought I’d get feedback. There’s a poll after the pictures. Guess what was in the mail today? The tickets! The Post Office returned them even though the address is exactly the same on the receipt, business card, and what the man confirmed over the phone! And because they took TWO WEEKS to do it, we’re screwed, because now we can’t clame they were stolen or lost! After all this, maybe it won’t surprise people to hear I’ve been having bad problems with my stomach. Tonight, the doctor said I’ve got bad acid reflux and my stomach lining is badly inflamed. I’m on a bland diet and medication for 3 weeks. Hopefully, that’ll take care of it. Last update: my aunt is home from the hospital. She needs live-in care for about 7 weeks; right now, 2 of my sisters are breaking up the first week between them, and then the live-in nurse will come in. I told DeeDee that if she gets tired of that, I’d be willing to come stay there and she can just get day help. I’m trying to focus on this good thing. I’m trying — and no Yoda jokes! I do the web site for the Salem County Humane Society. One of the volunteers now made this you tube video of the little guys that need a home. I see these little faces and want to take so many to MY home! And I read their stories about how they ended up at the shelter, and I want to take a baseball bat to some very nasty people.